The application is supportive of making comprehensive data migration. It provides with the facility to choose the data prior migration. One of the finest features software engineers added in the software is providing freedom to choose the NSF files that user want to migrate into PST file format. It is not always necessary for migrating all the files and user yearn for accessing only selected or important folders into PST files. For such scenario, user can choose Select feature. The tool gives preview of the converted Lotus Notes NSF files into PST. This will add ease to users as they will know the data exporting into PST file format. Sysessential for NSF to PST provides interactive and user-friendly interface. 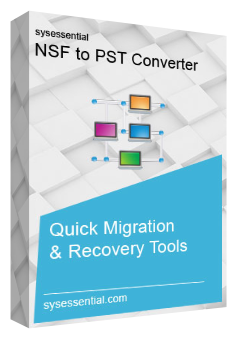 The detailed instructions about software in advance will help in making smooth NSF to PST migration. This hardly creates need for assistance from anyone of personal level. The migration of organizational data from NSF into PST is not carefree matter. This is why clients are given chance to go through the complete functioning of the software for free. Download Now button will start free tour to the tool and this will clear out everything related to software. You will be able to convert first 10 NSF items into PST in free and full version will migrate bulk data at one go. Sysessential for NSF to PST Converter keeps original formatting of data as it is even after migrating NSF files into PST file format. This will definitely create an easy for users as they will access converted data without any modifications in data. The application is supportive of making apt email data migration. In case, user is not known the location of NSF file then use Find NSF option and get the location in front of you. This is ultra time saving option. The software is extremely comfortable when it is to migrate Lotus Notes NSF files into PST file format. Tool is comfortable to be operated for any Lotus Notes versions as it supports all of them. Will software fails to work if MS Outlook and Lotus Notes not installed on computer machine prior data migration? How free demo helps me before heading for full licensed purchase? The free of cost demonstration edition of Sysessential for NSF to PST will show the working of the software prior buying the application. This edition will make you access the conversion of first 10 emails from every item of Lotus Notes into Outlook PST. This will give you complete idea how tool actually performs the migration of emails, contacts, calendars, tasks, to do list, journals. It entirely means that free trial run will prepare you for fully edition mode. Is there any possibility for catching preview of converted email items? Software developers truly understands the need of prior access to the email data and this is the reason provide preview of the emails prior migrating NSF files into PST. You can click any item and catch the preview prior finalizing and making migration into PST file format. How to avail activation key for Sysessential for NSF to PST? If you have seen deep inside the software via free of cost trial run then buying is the next and final option for users. Now, to catch the activation key, ensure for connecting with support team available 24 into 7. You can spot the application at your end by just connecting with the support team through phone. Is software able to move bulk data too? Is software simple to work with? The application is filled with all latest and advanced technologies. This is why millions of people across the nation wanted to connect with this tool when migration of NSF in PST is the main concern. As far as functioning is concerned, tool is really comfortable and easy to operate for making data migration from one email client to other. I found the high need for NSF file conversion into PST and thus was looking for some online software solution. Then I pointed out Sysessential for NSF to PST and this relieved me from data migration. The application is fast and extraordinary. It has migrated all the data from .nsf file into .pst file format. I liked the utility very much. Steps were automated and fully functional to go through. For migrating NSF files into PST file format of Outlook, firstly I tried manual method. The process became tiring and frustrating after a point and this took me towards third-party software tool such as Sysessential for NSF to PST application. I liked the features of the software and the way it multiplied ease for me. Now, I am able to read Lotus Notes NSF into Outlook PST with utter comfort level.